Like, if they communicate their plans for something before it's definite (or before they have a set date for it) then everyone gets into a cycle of expectation and anticipation that can end badly if things don't end up following through (like with Phil's first video this year taking longer than expected after he announced it, or some of the TBC dates during the tour falling through). +1 to this, I'm getting pretty frustrated with the hype around the omg-Phil-might-upload-sometime-in-the-next-couple-weeks tweet situations. I'm glad if it helps some people but I'm sort of on team upload if you're gonna upload but don't talk the talk unless you're ready to walk the walk. And when Dan communicates things like months or vague time scales for videos, it seems to me that it just makes people more restless and disappointed when it doesn't happen. Or things like Christmas baking... Just a bummer. I mostly agree. I definitely prefer joint content and solo Dan content over Phil's solo stuff. That said, I have enjoyed a few solo Phil videos in the past. I know I've watched that eBay mysery box video multiple times. I've been trying to work out what makes this most recent silly content different from the silly content of years passed. I think it comes down to having something (or someone) to play off of and overall timing. In the eBay mystery box video, he took time to read and comment on the descriptions before choosing each box, and then, when they arrived, he took time to react to each item. That rhythm worked well. 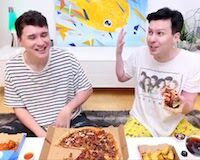 And, of course, in videos like Viewers Choose my Outfits and The Cheese Challenge, he was playing off of Dan, which we know works really well. These past two videos, on paper, should have worked. But their execution has felt rushed and sloppy to me. Thinking back to the animal past lives video, yes it had the added Dan element, but removing that, Phil took the time to make a strong case for this service, and to dig into all of the qualities of his animal past self. That extra time and those extra reactions heightened the comedy. In his most recent video, he jumped too quickly from one service to the next. He needed more time with each to make it funny. Also, the services he choose really weren't that interesting. I'm sure fiverr has better options. I think at this point the most important thing to keep his channel alive and his audience engaged is to post something. Not giving people anything to watch for prolonged periods of times is more damaging that releasing mediocre content imo. As pointed out both of them have an incredibly loyal and engaged audience, but there are limits to that (though it's hard to guess where they lie). I think that general engagement levels are already fraying at the edges (any k-poppies in the house and not posting anything will speed up the decline they're already experiencing. Of course I hope Dan returns with something personal that expresses a genuine sentiment he has or that strikes a 'relatable' chord with people, speckled with humor and thoughtful reflection in his typical fashion. Some parts of the fandom, not necessarily most imo, keep hoping for some sort of coming out video about sexuality or the ship. I don't see that second one happening as Dan has made his stance on phan very clear and you can't 'come out' of something that isn't there. A video about his sexual orientation might be possible but I still think is unlikely. If he wanted to make a 'classic' coming out video I think he would have done so before, it's not like people left him in doubt on how much they would have liked it. If he does it, I think he would do it more so because he values the message and wants to indulge the need of some people for representation, rather than because he wants to express his full sexual orientation/gender indentity himself. The most likely candidate to me seems to be more videos on mental health, since he said so himself he'd like to "maybe do more of that" and is actively supporting the cause through being an ambassador in organizations etc. I think it's also just his toughest struggle. Whatever the video is, I sincerely hope we won't see the same kind of backlash as after 'living my truth' got released. Personally, I was appalled how some people criticized him on his style or tone just because he didn't confirm the presumptuous narrative they had built up. Some expected a coming out. It wasn't a coming out. You don't get angry because a personal video someone shares doesn't conform to the idea you had of someone. It really annoyed me, because that and the unfair criticism Dan got after his last liveshows is I suspect part of the reason he's hesitant of sharing more. Last edited by Stakhanov on Sat Feb 09, 2019 5:07 pm, edited 1 time in total. I think it's a lose/lose situation, here. People want communication but at the same time they want dnp to do their things when they're ready but they also want them to do Something. Phil is doing his best to carry the Phandom on his shoulders - bless his soul - but it can't be enough. People had breakdowns over yesterday's ig story because they finally heard Dan's voice, for god's sake. +1. The Mystery Box video is probably my favourite Phil's solo video ever because it just worked so well. It was funny, it was interesting and it was well-timed. I think Phil is trying to find his new dimension at the moment and probably needs more time. RE: Fiverr - honestly, he should've just paid for the Gay Birthday Video. What I'm getting at is that Dan has already naturally and comfortably presented feminine as well as masculine characters in his videos. Of course, this was easier for him to do when he was so very young and pretty (since females are conventionally young and pretty). He did eventually decide to retire Becky and Jessica. But he has still comfortably played mature female characters like the NHS woman in "I nearly blinded myself" (the evil piano teacher was obviously a charicature, so not quite the same thing). like @liola said, i agree that what @queerofcups (sidenote: dw i understand your frustration, ive been in the fandom game for a long time and its always upsetting when people are being immature) described about the current state of the phandom is quite accurate. we all miss dan, theres no lie in that. but the expectation we put on him as the audience is.....tricky because dan is a perfectionist himself and also has high expectations of his videos....thats a hard habit to change. i think its been especially harder for everyone for the fact that weve been spoiled rotten last year from the tour and all the gaming videos and joint content, so when theyve announced hiatus on most of those things, the phandom is basically in tantrum mode right now. im not saying everyone is like that though, its always a case of the loud ones feeling like the majority and unless we have the graphs to back it up, we will never know. it still doesnt change the fact that it causes tension and frustration for everyone regardless of what your stance is. I get all the pleas for communication, but at the same time I feel that communication is a bit of a double edged sword for them (and us). Like, if they communicate their plans for something before it's definite (or before they have a set date for it) then everyone gets into a cycle of expectation and anticipation that can end badly if things don't end up following through [...]. That messes with us as well because we get all excited for something and then have to deal with frustration and disappointment. On the other hand, holding off of announcing anything until it's fully ready to go is seen as a lack of communication, and leads to phandom tearing itself apart in the periods of silence and over-reacting to the crumbs that we manage to scavenge. but yeah, i do agree that its a kind of argument that will just end up in circles and its most definitely a tough balancing act. its already hard for me to handle 4 tantruming toddlers, imagine them having to deal with billions of kids and seemingly adults who whine for content. im mostly exaggerating here but you get my gist. if i were in their shoes, its definitely hard and not everyone is blessed in being skilled at communication or public relations. even if we were the most behaved fandom in the world, it will still not change the fact that theyll still have to deal with billions of us...and everybody not everyone can be appeased because different people have different expectations. im just going to stop now before i start rambling incoherently. at this point, im just gunna lay down and wait. im too old for this. @lefthandedism Aw, you've made me wish for more sketch comedy from Dan! I swear most of the time I'm just here for the bants, and since there's no banter in solo videos I just sort of appreciate them for what they are and don't get too excited for them, but with sketch comedy Dan can have bants between his characters and that's good enough for me apparently. Plus Dan's 'valley girl' like personas always make me laugh--Bratty and Catty (Phil) from Undertale, the 'what is this voice you're doing today' voice from the pizza intermission gaming video, and a bunch of the older Becky and Jessica sketches. @lefthandedism i totally forgot about that stickaid thing! but just to offer my two cents, theres a part of me that hesitates to cite his "female" characters as him being comfortable with presenting his feminine side simply because a) hes acting out a character that the video calls for, b) he was a drama kid, so hes comfortable to play different characters to some extent, c) some can argue that he was just doing it for comedic effect in some of his videos. its easy to say "oh he seems comfortable playing a girl so he must be in touch with his feminine side" but it could come across as ignorant to some people so its a good idea to be careful with saying that. yes, it "feels" as if feminine dan is more of a recent thing is because its only until now that hes started to talk to us openly about such things. (dan) wearing a dress is easy especially if its for something that requires you to "dress-up" as something or someone because you can just chalk it up to "participating" in the event, but painting your nails or putting on lipstick for your personal gratification is different. anyways, if dan makes an official video addressing his personal preferences in how he presents his own gender and what his overall thoughts about gender and the struggle/exploration that comes with it, that will be interesting to me because its something that he had only teased or talked about in liveshows. Not that it matters much but during the 2011 Stickaid 24 charity livestream the viewers requested that the youtubers did certain things if they hit certain amounts of money. PJ gave Chris a lap dance, someone licked another person’s foot and Dan sang The Llama Song. 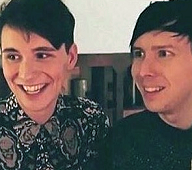 At one point Dan had a pair of his boxers on the table (I have no prior context) and they were talking about him switching clothing with another guy there. I think (though I don’t know for sure) that they upped the ante and Dan agreed to switch clothes with a girl (you can see her in the same red dress throughout the stream). Interestingly enough Dan avoided getting naked in a conga line by keeping the dress on. Most of the guys took their tops off at the beginning and were down to boxers by the end. PJ and a couple other guys were wearing tutus. PJ took off his hoodie and shorts at the end, but kept a T-shirt and the tutu over his boxers, I think there was only one other guy who kept his clothes on. Wild times, truly. PJ took off his hoodie and shorts at the end, but kept a T-shirt and the tutu over his boxers, I think there was only one other guy who kept his clothes on. Wild times, truly. I think that was the same year that Charlie McDonnell took his pants off on stage at Vidcon and promptly broke Tumblr. (I was in the audience). That was definitely a *time* to be YT trash. I get all the pleas for communication, but at the same time I feel that communication is a bit of a double edged sword for them (and us). Like, if they communicate their plans for something before it's definite (or before they have a set date for it) then everyone gets into a cycle of expectation and anticipation that can end badly if things don't end up following through (like with Phil's first video this year taking longer than expected after he announced it, or some of the TBC dates during the tour falling through). That messes with us as well because we get all excited for something and then have to deal with frustration and disappointment. Last edited by dancy on Sat Feb 09, 2019 8:56 pm, edited 1 time in total. ...... is this where I break in to say I still think they're moving? Because I still think they're moving and that explains the lack of some kinds of content. ...If they’re moving can we assume regular gaming/joint content will return after they’ve moved to a new filming space? Me too. The moving hill is a sweet place. Okay, I really like the stuff Phil writes for his YouTube members, they're like a cute little mini blog posts and they feel very casual and genuine. What if this 'content draught' is just Capita£ester's way of encouraging more people to buy into memberships? I joke, I joke, but I'm like two steps away from handing over my £5/month. 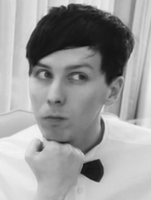 Hm, I find interesting that he said he's not planning on doing liveshows on "AmazingPhil" instead of "Youtube". It makes me wonder if we'll get liveshows on yt but on another channel. That fursona is terrifying, the empty eyes mostly. Yikes. It is lovely to hear Phil’s thoughts in the post and the liveshow reply. On the moving hill, I’ve wondered if they might just have packed up the filming flat and have the extra stuff to sort out in the living one plus be pulling back on showing us stuff while they think about things, or as a new more private thing despite us having seen parts of the flat, but it does seem more likely it’s not quite that deep and is indeed a full move. Oh that wording is SO specific.... I have no guesses as to when (I'm still thinking March at the earliest, after Dan has posted a video) but still I'm gonna voice the guess everyone is probably having: liveshows that are a membership perk of a joint channel.